Immunoprecipitation of extracts from HeLa cells, treated with either U0126 #9903 (10uM, 1 hour, lanes 1, 3, and 5) or TPA #4147 (200uM 20 minutes, lanes 2, 4, and 6) using #3423 Rabbit (DA1E) mAb IgG XP® Isotype Control (Sepharose® Bead Conjugate) (lanes 1 and 2) or Phospho-p44/42 MAPK (Erk1/2) (Thr202/Tyr204) (D6A9) Rabbit mAb (Sepharose® Bead Conjugate) (lanes 3 and 4). Lanes 5 and 6 are 10% input. Western blot analysis performed using #8544 Phospho-p44/42 MAPK (Erk1/2) (Thr202/Tyr204) (D13.14.4E) XP® Rabbit mAb (HRP Conjugate). Supplied in 10 mM sodium HEPES (pH 7.5), 150 mM NaCl, 100 µg/ml BSA, 50% glycerol. Store at –20°C. Do not aliquot the antibody. Phospho-p44/42 MAPK (Erk1/2) (Thr202/Tyr204) (A4M8T) Rabbit mAb (Sepharose® Bead Conjugate) detects endogenous levels of p44 and p42 MAP Kinase (Erk1 and Erk2) when phosphorylated either individually or dually at Thr202 and Tyr204 of Erk1 (Thr185 and Tyr187 of Erk2). The antibody does not cross-react with the corresponding phosphorylated residues of either JNK/SAPK or p38 MAP Kinase, and does not cross-react with non-phosphorylated Erk1/2. Monoclonal antibodies are produced by immunizing animals with a synthetic phosphopeptide corresponding to residues surrounding Thr202/Tyr204 of human p44 MAP kinase. This Cell Signaling Technology antibody is immobilized via covalent binding of primary amino groups to N-hydroxysuccinimide (NHS)-activated Sepharose® beads. 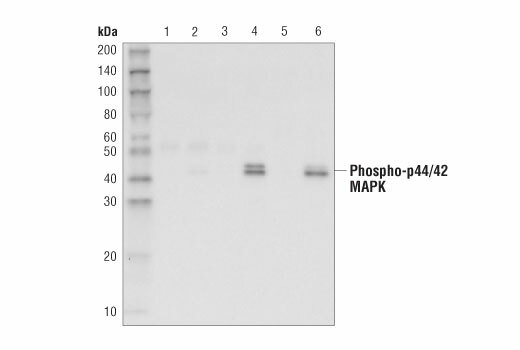 Phospho-p44/42 MAPK (Erk1/2) (Thr202/Tyr204) Antibody (A4M8T) Rabbit mAb (Sepharose® Bead Conjugate) is useful for the immunoprecipitation of phospho-p44/p42 MAPK. The antibody is expected to exhibit the same species cross-reactivity as the unconjugated Phospho-p44/42 MAPK (Erk1/2) (Thr202/Tyr204) Antibody #9101.